The economic value of environmental goods is commonly determined using the concepts of willingness to pay (WTP) or willingness to accept (WTA). However, the WTP/WTA observed in different countries (or between individuals) will differ according to socio-economic characteristics, in particular income. This notion of differentiated values for otherwise identical goods (say, a given reduction in mortality risk) has been criticized as unethical, most recently in the context of the 'social cost' chapter of the IPCC Second Assessment Report. These critics argue that, being a function of income, WTP/WTA estimates reflect the unfairness in the current income distribution, and for equity reasons uniform per-unit values should therefore be applied across individuals and countries. 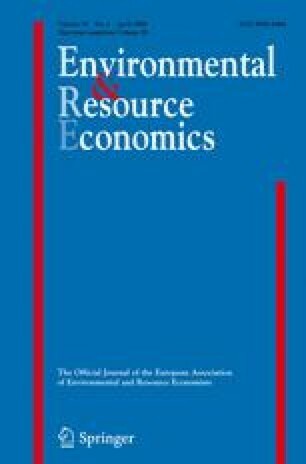 This paper analyses the role of equity in the aggregation of climate change damage estimates, using basic tools of welfare economics. It shows one way of how WTP/WTA estimates can be corrected in aggregation if the underlying income distribution is considered unfair. It proposes that in the aggregation process individual estimates be weighted with an equity factor derived from the social welfare and utility functions. Equity weighting can significantly increase aggregate (global) damage figures, although some specifications of weighting functions also imply reduced estimates. The paper also shows that while the postulate of uniform per-unit values is compatible with a wide range of 'reasonable' utility and welfare specifications, there are also cases where the common-value notion is not compatible with defensible welfare concepts.